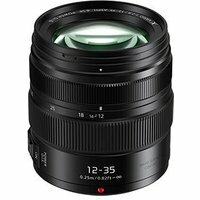 Suitable for a wide range of applications, the Panasonic 12-35mm f2.8 II LUMIX G X Vario ASPH Power OIS Lens for Micro Four Thirds features a wide-angle to short telephoto focal range with bright f/2.8 constant-aperture, making it ideal for capturing the natural atmosphere for both video and stills. The lens offers also support for Power O.I.S (Optical Image Stabiliser) and 5-axis Dual I.S. (Image Stabiliser) when used with the Lumix GH5 and G80 cameras to achieve increased performance and mobility.